Few months ago we talked about the unmissable exhibition "1917", that took place at the Centre Pompidou-Metz. We now come back to it with a short post, since a two-day conference organized by the Centre Pompidou-Metz in collaboration with the German Center of Art History is planned as the concluding meeting of the exhibition. 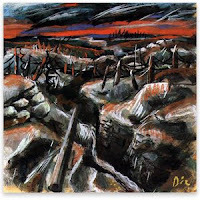 20th and 21st September, some leading experts on Great War and on the related artistic production will gather in Centre Pompidou-Metz to discuss and analyze some of the key topics of the exhibition. Beside a starting panel concerning some psychological and cultural attitudes in experiencing and depicting the WWI in France and Germany, on Thursday afternoon the works will converge on the figurative arts as avant-gardiste experimentation (above all, Dadaism and Expressionism) in their succeeding changing phases and in connection with the broader cultural – i.e. philosophical, theoretical, even political – discussion during the war years. Figurative art will be at the center of the opening communication, concerning Picasso's Parade, even on Friday morning panel, that will continue widening the discussion towards other arts, such as dance, poetry and cinematography. The closing panel will deal lastly with the contemporary artistic reception and re-elaboration of the legacy and memory of WWI, and especially of the year 1917, as turning point of the conflict. Further practical information and the full program here.